/ Best Calzone in Destin FL / Come Enjoy WORLD SERIES & COLLEGE FOOTBALL FREEDOM FRIDAY@Landshark’s! 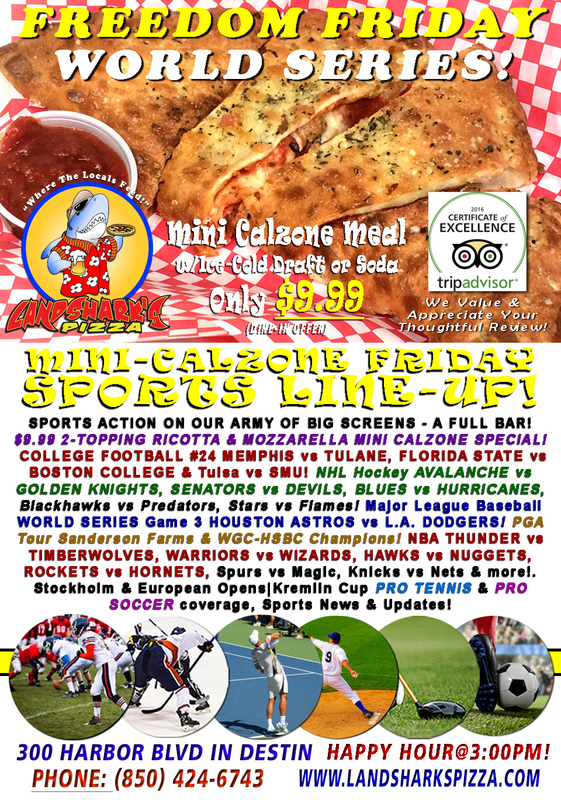 NHL, NBA & PGA plus $9.99 2-Topping Calzone w/Brewsky! Come Enjoy WORLD SERIES & COLLEGE FOOTBALL FREEDOM FRIDAY@Landshark’s! 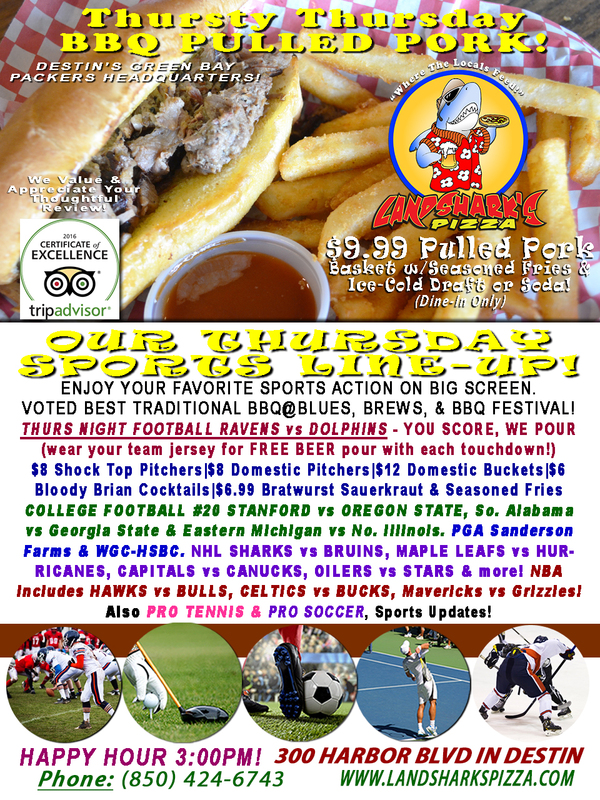 NHL, NBA & PGA plus $9.99 2-Topping Calzone w/Brewsky! There’s only one scientifically-proven way to beat chilly weather in Destin, and that’s by jumping around yelling and shouting for your favorite team. 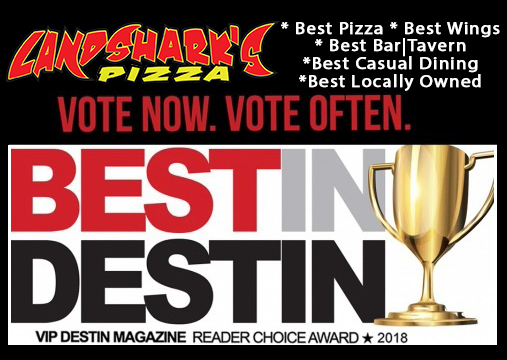 Landshark’s showing NCAA College Football, MLB World Series, Pro Hoops, PGA and more along with a 2-TOPPING RICOTTA & MOZZARELLA MONSTER MINI-CALZONE with an ICE COLD DRAFT or Soft Drink only $9.99 dine-in special to go with great sports on an army of big screens and a full bar! SPORTS ON OUR ARMY OF BIG SCREENS – MLB WORLD SERIES Game 3 HOUSTON ASTROS vs L.A. DODGERS! College Football #24 MEMPHIS vs TULANE, FLORIDA STATE vs BOSTON COLLEGE & Tulsa vs SMU. NHL Hockey action includes AVALANCHE vs GOLDEN KNIGHTS, SENATORS vs DEVILS, BLUES vs HURRICANES, Blackhawks vs Predators, Stars vs Flames! NBA Hoops THUNDER vs TIMBERWOLVES, WARRIORS vs WIZARDS, HAWKS vs NUGGETS, ROCKETS vs HORNETS, Spurs vs Magic, Knicks vs Nets & more! PGA Tour Sanderson Farms Championship & WGC-HSBC Champions (Shanghai). Also, ATP Erste Bank Open (Vienna)|ATP Swiss Indoors PRO TENNIS & PRO SOCCER coverage plus plenty of other Sports Broadcasts, Sporting News, Analysis, and Commentary! NASCAR This Week: (Sat) Camping World Trucks Texas Roadhouse 200 & (Sun) Monster Energy Cup Series First Data 500@Martinsville Speedway. PGA Golf This Week: Sanderson Farms Championship & World Golf Championships-HSBC Champions (both Thurs). 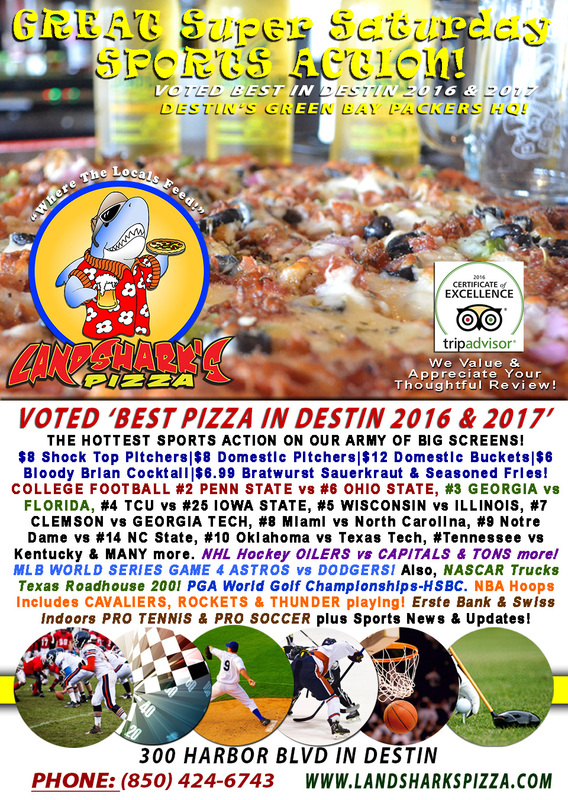 Previous Post: « Landshark’s RAVENS vs DOLPHINS|You Score, We Pour & MORE Specials! $9.99 BBQ Basket, NBA, NHL & More!